This exclusive figure from McFarlane Toys was available at Walgreens and Hastings Entertainment in the USA. In Canada, we were able to secure a few from our distributor. It is sold out as we tried to reorder this item. Buy it fast as it cannot be restocked. 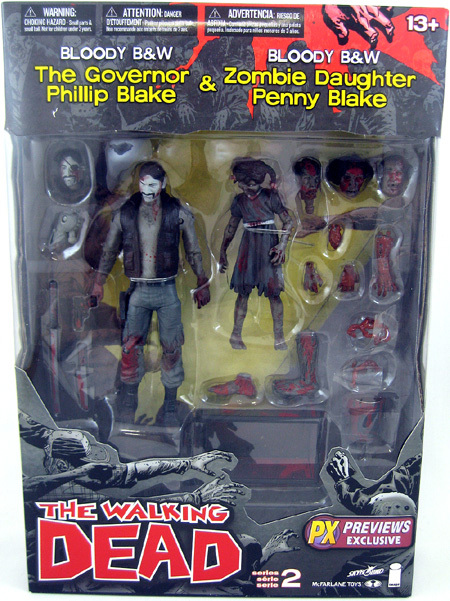 Oh yea, we also got in The Walking Dead Series 4 along with the Merle and Daryl Dixon 2-Figure Boxed Set….check it out. Staying true to the comic, this blood-splattered black & white version of The Governor & Daughter Zombie is the perfect addition to any The Walking Dead collection. 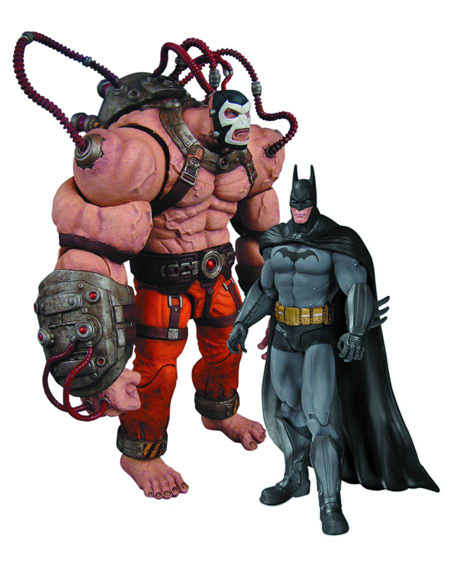 This box set still includes all the articulation and gory accessories included with the standard figures. Super Hero Squad Figures: 2010 Wave 2 is HERE! Reptil & Dr. Doom, Abomination & Thor and Spider-man & Scarlet Witch are the three newest arrivals in our Marvel Superhero Squad collection. They’re the adorable versions of all your favourite Marvel heroes and villains and make great miniature collectibles for kids or anyone who likes their toys stylized. Of course, these guys have also hit the airwaves as part of the Superhero Squad TV show, which features the voice talents of everyone from Cheryl Hines (Curb your Enthusiasm) to Tom Kenny (Spongebob Squarepants), the later of which spoke to CBR about his part on the show. Read the whole interview over on the site, but here’s an excerpt. CBR News: Tom, how did you get started on the pop culture friendly path of your voice acting career? Where did that interest come from? Tom Kenny: The easy answer is that I was a part of that pop culture world and I’ve loved it all ever since I was a little kid. I loved comic books and monster movies and all the standard issue geeky stuff. Just being able to mess around with my voice has given me a nice way to be involved in this world that I’ve always enjoyed as a consumer and reader, and now as an artist. I messed around in rock and roll bands when I was a little kid, and I still do. Then I kind of stumbled my way into standup and sketch comedy. Eventually, I became employed in that while doing the occasional voiceover, but the whole time I was doing those things, I thought that voiceover was the thing I was best at. I wished that could be 98% of my pie instead of two percent. It’s kind of a tough nut to crack. I made a living as a standup for many years and eventually the voiceover thing was able to supplant a lot of that stuff. It turns out that I was right – voiceover is better. [Laughs] Voiceover is the best-kept secret in entertainment. From an outside perspective, I imagine it’s got to be fun to have a job where one minute you’re Iron Man or Captain America, and the next minute you’re M.O.D.O.K.. It doesn’t get any more different than that. Yeah! Captain America, M.O.D.O.K. and occasionally Juggernaut and Colossus when they make their brief appearances. Iron Man as well. It’s a perfect job for what you would call the shy show-off, you know what I mean? The person who doesn’t exactly want to be famous and deal with all of the horrific stuff that being an on camera celebrity brings to your life, but you still want to make a living as an actor. If you’re not driven by wanting to see your face on the cover of “People Magazine,” then being a voice actor is the best. It’s all of the fun of being an actor without any of the mess. Oh yeah. Comics were huge for me as a kid, particularly the Marvel stuff. My parents weren’t particularly thrilled about me reading comics. “Why can’t you read a real book?” I did that as well, but I also liked to read comics. Unwittingly, they created a comic book freak monster because I loved any and all genres of comic books. Superheroes, humor, war, horror, all that stuff. I got really into it. I was able to look at the history of those characters and I just thought the characters and the world were so rich. The drawings blew my mind and probably a lot of other people’s minds, too. When you look at Stan Lee’s writing and Steve Ditko’s weird drawing – those early “Spider-Man” issues still make me crazy when I read them. There’s so much undiscovered stuff that you’ve never heard of still getting reprinted. It’s fantastic! I can’t believe there’s still great stuff that I’ve never seen and also great new stuff coming out. It’s been a lifelong addiction for me. Naruto is one of the many animes to make its way across the ocean and find a place in the hearts and minds of audiences across North America. And with the coming of such shows, there is bound to be the coming of merchandise. Fortunately, given the oft-discerning tastes of anime fans when it comes to the particular look of the series, the merchandise is generally of a very high quality and the Naruto figures we’ve got over at CmdStore.com are no exception. Each one is brilliantly designed and sculpted, ranging in size from 3 to 12 inches and fully capturing the awesome dynamism of the hit show! Check out Naruto and Deidara in the first series of new toys already available for pre-order! They’ll soon be joined by Gaara, Kakashi, Itachi and Sasuke, all of which’ll be shipping later down the line but can already be pre-ordered.